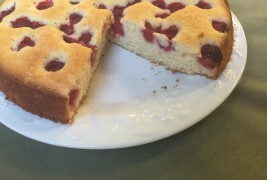 This is an easy, light, delicious cake to make when you pick or buy fresh raspberries. The light lemon flavor highlights the berries. I found it on the internet and would love to credit its maker. 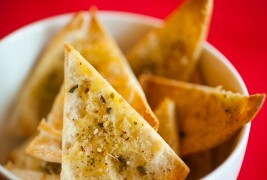 These crispy pita chips are quite simple to make, and you’ll notice they taste much better than anything from a bag. After cutting whole pita into wedges, you brush with olive oil and top with a Middle Eastern spice condiment called za’atar, a combination of toasted sesame seeds and dried herbs like oregano, marjoram, thyme and salt. Some versions include sumac, a lemony flavored spice found in Middle Eastern stores. You will have some za’atar topping leftover for additional batches.